The National Metal and Materials Technology Center (MTEC) under the supervision of the National Science and Technology Development Agency (NSTDA), led by Ms. Siriwan Tantawechkij (standing row, center), Deputy Executive Director of MTEC in cooperation with the Faculty of Engineering, Chulalongkorn University, led by Asst. 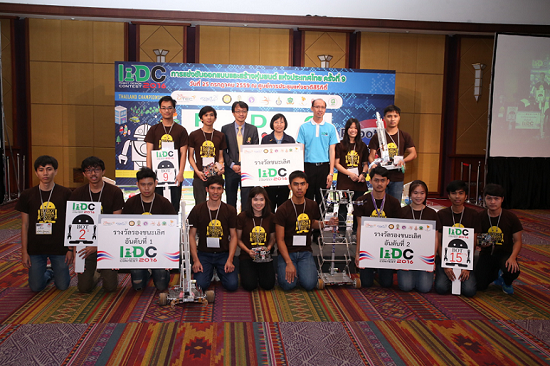 Prof. Dr. Wittaya Wannasuphoprasit (standing row, 3rd from left), Head of Department of Mechanical Engineering, presented awards to the three winning teams of the final round of “Robot Design Contest 2016” or “RDC 2016” recently held at Queen Sirikit National Convention Center. They will represent Thailand to compete in the International Design Contest (IDC) RoBoCon 2016 which will be held at the Faculty of Engineering, Chulalongkorn University from August 8 – 19, 2016, with the final match scheduled for August 20, 2016 at Pantip Pratunam.